It's unclear why a race car couldn't make a turn or slow down before it hit and killed two people. SAN FRANCISCO — The teenage driver already had multiple race victories under his belt and was pursuing a course laid out by several generations of his family when tragedy struck. Chase Johnson’s car careened off a northern California track Saturday evening and killed two people in pit row – his 14-year-old cousin Marcus Johnson and 68-year-old race car owner Dale Wondergem, authorities said. No one else was injured in the crash at the Marysville Raceway Park, about 40 miles north of Sacramento, and spectators were never in jeopardy, according to the Yuba County Sheriff’s Department. The younger victim was not an official member of his cousin’s crew. Investigators are trying to determine why he was in the pit area, Undersheriff Jerry Read said. “Everybody’s hurting. There’s nothing we can do. This is terrible,” the father tearfully said. He said his son and cousin were like best friends. “He had so much to look forward to,” the father said. Wondergem was pronounced dead at the scene and Marcus Johnson was pronounced dead shortly after arrival at a hospital, authorities said. The Marysville raceway was hosting the California Sprint Car Civil War Series on the opening day of its season. Wondergem owned one of the race cars at the track Saturday, but not the one involved in the crash, Read said. The crash occurred when six or seven sprint cars were doing warm-up laps before the start of a race. The car of 17-year-old Chase Johnson left the track at an undetermined speed, sheriff’s officials said. In a statement Sunday on behalf of his family, Don Johnson, who is the driver’s father and victim’s uncle, thanked the racing community for their thoughts and prayers. “Our family has suffered an unspeakable tragedy with the passing of our precious Marcus Johnson and Dale Wondergem. There are no words to express our sorrow. Our family has been racing for four generations and loves the sport that has now brought us so much pain,” it said. Messages left for the Marysville Raceway’s spokesman and promoters were not immediately returned. Chase Johnson is a senior at Petaluma High School north of San Francisco and is a fourth-generation race car driver, according to his website. He did not respond to an email seeking comment Sunday. Steven Blakesley, a race announcer who was watching from the stands, said he thought Chase Johnson’s car had a mechanical problem because he was driving about 90 mph and couldn’t make a turn or slow down just before the crash. The sprint car circuit is seen as a stepping stone to higher levels like NASCAR and many drivers start racing as young as 15, as Johnson did, Blakesley said. Others on the circuit, where small, high-powered cars race on short dirt ovals, were older drivers whose careers had peaked earlier. Two-time NASCAR Nationwide Series champion Ricky Stenhouse Jr. began his career in sprint cars at age 15. He said current hotshot NASCAR racer Kyle Larson was racing sprint cars around California at 12 years old. The race track fatalities come less than a month after a crash on the last lap of a race at Daytona International Speedway injured at least 30 fans Feb. 23. 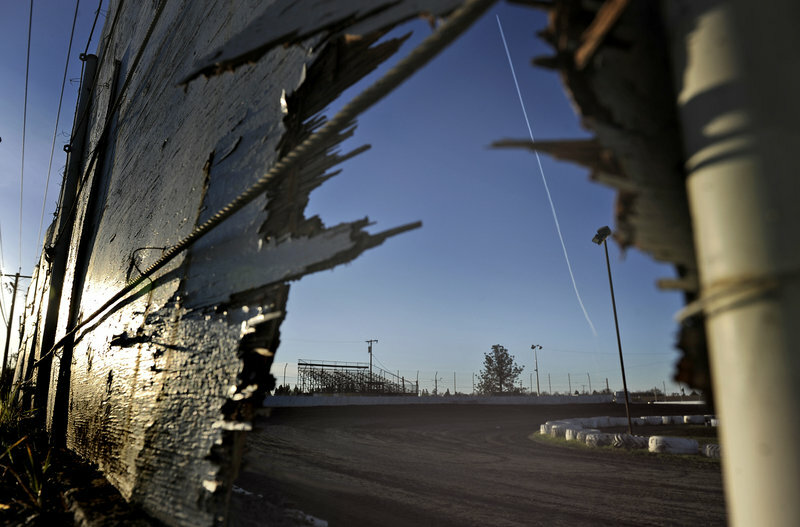 The victims were sprayed with large chunks of debris — including a tire — after a car careened into the fencing that is designed to protect the massive grandstands lining the track.